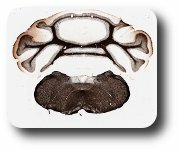 The Mouse Brain Architecture Project web site features multiple image series consisting of sections from the myelin-stained C57BL mouse brain. 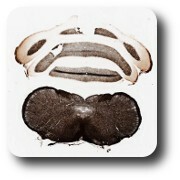 This series consists of serial coronal sections of the mouse brain (sectioned at 30μm and illustrated as 1 section in 3 (section-to-section spacing of 90μm)). Sections have been reacted by the Gallyas silver stain. The series begins at the level of the posterior medulla (brainstem) and posterior fourth ventricle. Comments made within this unit are selective, designed to highlight salient features and emphasize landmarks useful for thinking in 3-D space. Several tracts ascending from the spinal cord to higher levels; for example, fasciculus cuneatus and f. gracilis, at the dorsal midline. These tracts convey sensory information, and are at the early stage of the multisynaptic sensory pathways, from spinal cord to cortex. Several tracts descending to the spinal cord: the spinal trigeminal tract, at the lateral edge; and the pyramidal tract at the ventral midline. Abundant fibers forming small bundles cut in cross section, which pass through aggregates of cell bodies (not seen in this myelin stained tissue), in what thus appears as a “reticular” nucleus. The cerebellum overlies the section. Fasciculus cuneatus, offset from the dorsal midline. Abundant fibers passing through and terminating in the reticular formation. In this section, the inferior olive is still in evidence, as a pale region ventrally. Axons originating from the inferior olive form the large middle cerebellar peduncles, en route to Purkinje cells in the cerebellum. The fasciculus cuneatus and f. gracilis have terminated in their respective nuclei. A new fiber tract, the medial lemniscus, originates from neurons in these nuclei and continues anteriorly to the thalamus. The corticospinal tracts can be identified at the ventral midline.